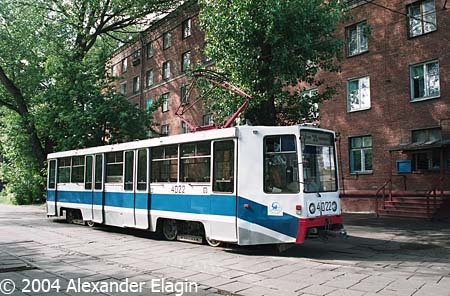 Chesmenskaya Street along one wall of Oktyabrskoe tram depot is probably one of the shortest streets in Moscow. There is practically no motorcar traffic in this street at all, but the tram tracks are present. 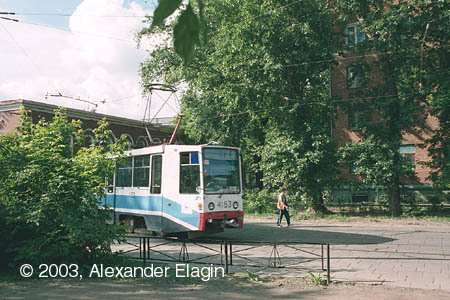 The street leads to a cosy terminus named Novokonnaya Square located in a green area by a large pond. It is rather difficult to suppose to find such a place in the middle of a large industrial district, but this is the style of Moscow - even in the ugly and noisy environment one can suddenly locate a small oasis where birds sing and grasshoppers chirr. 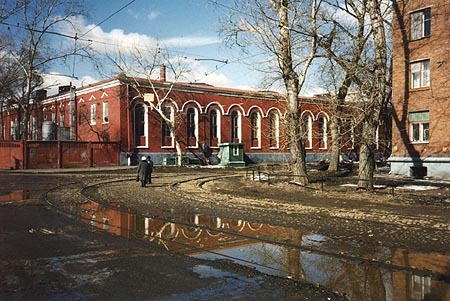 The depot building again, now viewed from Novokonnaya Square in one of the first warm spring days of March. The ancient wildstone pavement seen in this photo exists no more - it has been replaced with standard concrete slabs during the regular track maintenance. Another tram arrives to the terminus. Note that the pavement has changed - concrete slabs had replaced the cobblestones. The control room is located in the red-brick building. 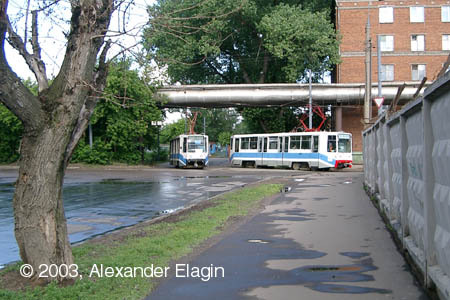 Novokonnaya Square terminus consists of two tracks. Three routes (8, 35 and 45) have their control room here. The pond to the right is obscured by trams, but anyway it is frozen in winter. 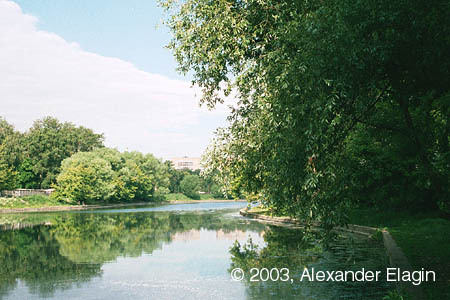 The pond looks better in the summer time, although the environment could be even better. A large tree covers the terminus with a green roof. 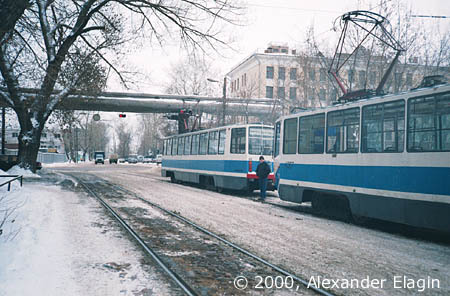 The trams are leaving one by one en route to their first stop - Oktyabrskoye Depot.